After seeing an exhibition of Goya‘s drawings earlier this year I was excited to see this exhibition, showing a totally different side to the artist. The Courtauld’s collection of witches and old women gave us Goya’s imagination unleashed, creations of nightmarish figures and macabre scenes; whereas the National Gallery shows a more conventional and traditional Goya. We are launched into the 1780s when he was well on his way to becoming the most popular portrait painter in Spain, and whisked through the years to his death in 1828. During this time his homeland underwent something of a reform due to revolutionary events in nearby France, and Goya benefitted from the influential patronage of both the Spanish royalty and aristocracy, both of whom were seeking to safeguard their country against social and economic upheaval. As Velázquez before him, Goya took his turn as court painter, reinforcing national power and patriotism as he did so. After twice being rejected from the Madrid Academy of Art in his twenties, Goya decided to teach himself. He travelled to Italy to learn from Antiquity and the masters of Renaissance. We know from his sketchbooks that he drew the ordinary people on the street, observing and depicting their characters, emotions and movements. But he didn’t begin painting portraits in earnest until the age of 37. Already an established artist he began to gain commissions for formal portraits, which would later lead to working for the court of Charles III of Spain. 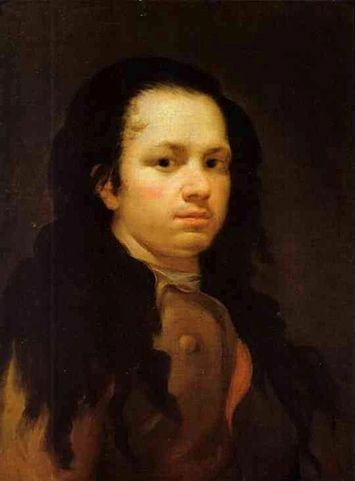 The first painting in the first room is a Self Portrait (c.1780) done when Goya about 34 years old. While his face has a boyish chubbiness, the manner in which it is executed is mature and insightful. He looks out with confidence. He cuts directly to the core of the subject matter, in a way that was surely influenced by artists of the Northern Renaissance and those who came after, specifically Rembrandt. However there is something else there, an idiosyncratic style that I think infiltrates all of his works. A painting I was looking forward to seeing in the flesh was Manuel Osorio Manrique de Zúñica (1790s). 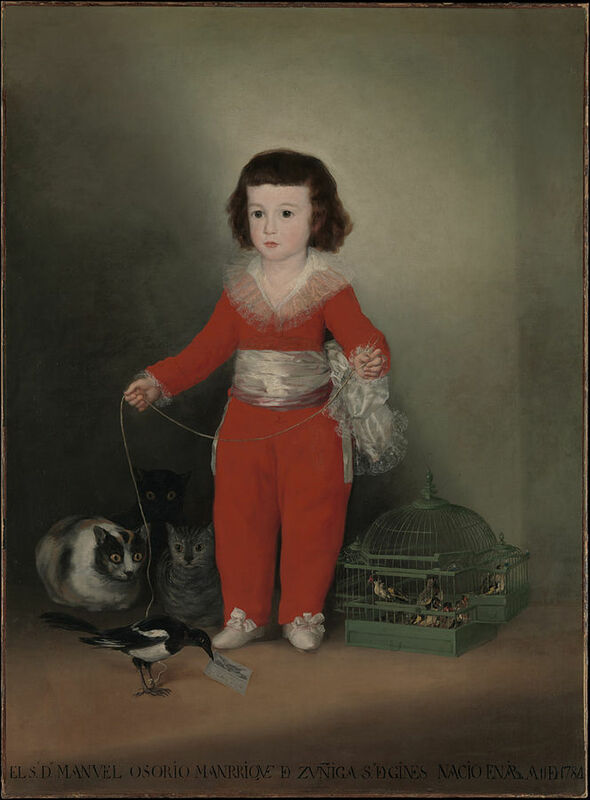 Very much in the manner of Velázquez, Goya portrays this little boy with tenderness dexterity. The silken sash and intricate lace are exquisitely detailed. But I suppose what is most interesting about the work is the composition and inclusion of animals. It isn’t known precisely what Goya meant by this, but thinking ahead to his Los Caprichos (1797-8) we start to get a feel for his fantastical imagination and strange use of symbolism. The magpie at the child’s feet, which he has on a leash tied to its leg, could be alluding to the rhyme ‘one for sorrow’, as the child died in 1790. The caged birds (innocence or the soul) and the cats that watch it hungrily could portray a threat to fragility. What I hadn’t noticed before was the card the magpie holds in its beak, a signature of Goya, a sort of ‘I was here’. Goya’s circle of friends and patrons included many great Spanish intellectuals, those pioneering the Enlightenment in the wake of the French Revolution. With his reputation growing the artist became Director of Painting at the Madrid Academy, the very place that had denied him entry 30 years previously. But in the early 1790s he fell seriously ill, and he was left acutely deaf. This must have affected his work massively, as he was renown for being a conversationalist with his sitters. But it also provoked something new and a bit rebellious in him. The portrait below of Ferdinand VII in Court Dress (1814-15) is a standard portrait format with a full-length figure and dark backdrop. 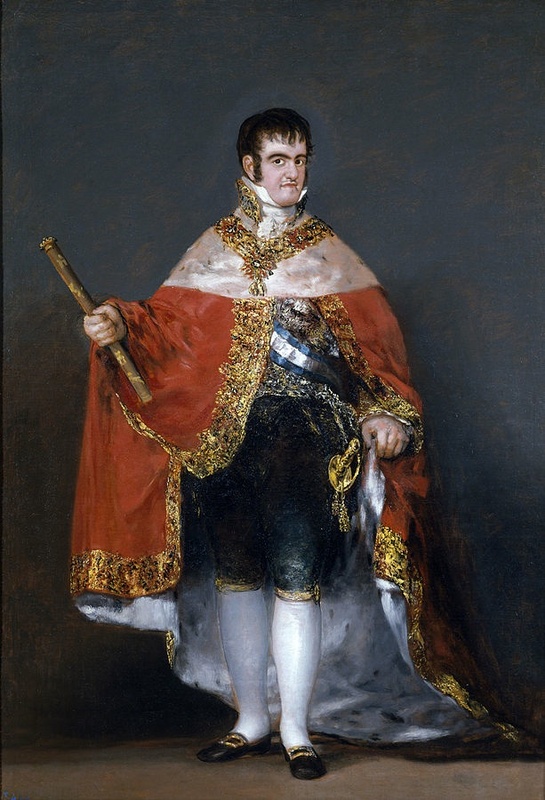 Goya was never one to flatter his sitter, not even the King of Spain, who was by all accounts a bit of a tyrant. Here in his full royal regalia he is the very definition of pomp and pretension. He turns to us, his squat body and very Bourbon face, addressing us with oozing swagger. You can’t help but feel a bit sorry for him, swamped in his cloak and uncomfortable looking starched collar. Goya almost breaches the borderline of satirical caricature here, perhaps a reaction against being obliged to paint the likeness of a man he did not admire. After recently being restored to the Spanish throne Ferdinand renounced the Constitution, the very thing he had promised to uphold as ruler. You can see a ‘heavier’ style of painting here too, blobs of impastoed paint create the illusion of golden trim and jewelled accessories. Goya was now in his late 60s, and his increasing deafness paired with a general ill health caused him to withdraw from the court, and focus on what was important to him. 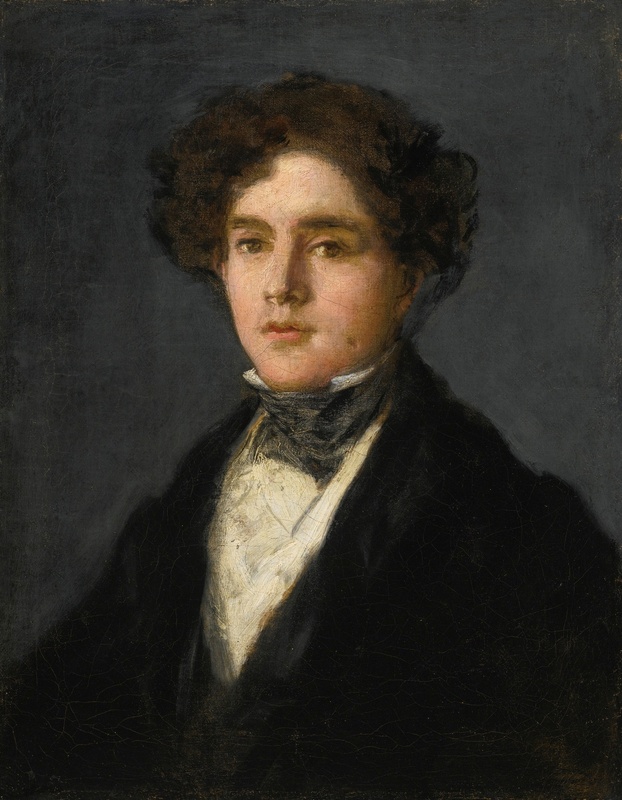 This portrait of Goya’s only grandson Mariano Goya e Goicoechea (c. 1827) is one of the artist’s last paintings, the artist was about 81 years old and the sitter around 21. Mariano is depicted informally as a handsome young man with an intelligent face, full of promise and potential. Goya is clearly proud of him. The dominance of darkness in the background and the mop of hair emphasises the youthful face of the young man. Those brown eyes are not unlike those in Goya’s self portrait above, they too have something going on behind them. At the end of his life Goya was living with his maid (his junior by 35 years) and he was increasingly exasperated with his son Xavier (the only surviving child from eight) it must have felt that the legacy of the artist’s name would be on the shoulders of this young man. Indeed he had left the majority of his money to him, which he would unfortunately squander. Probably painted for himself this portrait is strikingly modern with monochrome palette and spontaneous sketchy brushstrokes. This dark painting draws the end of the exhibition and the end of Goya’s life. I have to say that Goya is not a perfect painter. Yes he paints truth, ‘warts and all’ in honesty, but there is nearly always something weird or not quite right about his works. What I love about Goya is his adaptability; he can be painting what is in front of him or something of his own invention without losing any sense of himself. He is an artist of imagination, he broke from tradition with invention and complete individuality.